Wait! This isn't Black Cat! Hope this is a neutral instead of a class minion. It has so many potential in a mech rouge deck. This card should have been a neutral card. Class cards are mostly better than their neutral counterparts and this doesnt get anything extra from being a class card other than a 'Mech' tag. the gold animation looks cool though. I don't know why this is rare. A 3/3 for 3 is nothing special with this ability. After the nerf of Dalaran Mage, we needed this. 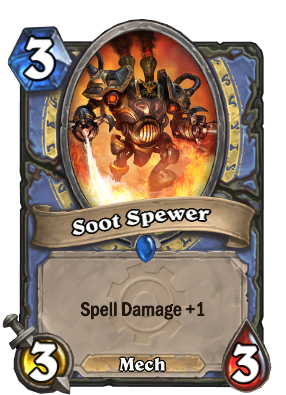 Nice card, loving the smaller mage drops. i wish it was neutral . . . it fits so nicely between kobold and the ogre. Turn 10 5 damage Flamestrike with a 3/3 on board? Yes, please!